And so goes Christmas 2011. In and out like a thief in the night, only instead of taking things he left them. All over the floor. Packages, presents, paper and bows. So, Lisa, how did you fare? Surprisingly well, actually. I knew I was getting a small digital camera, something more mobile to take to author signings and what-not, instead of the huge and unwieldy digital SLR. I'd picked this one on my own, reading through Amazon reviews for the best-rated with the highest amount of pixels and best zoom. This one's a wide-angle, as well, and you can take perfect panoramas. The kids? Video games for the boys and my youngest, who collects 1:18, got his dream collector car: a Koenigsegg something or other in a fetching orange. He spent the day examining it, bit by bit, with the magnifying glass it came with. Because it's accurate down to the last detail, handmade and limited edition and all that. A little nutty giving him such a thing but he worked on me for a month. I'm a sucker for, "It would make me so happy. You don't even know." For my daughter, a lovely necklace as well as some Doctor Who paraphernalia which she'd requested, including #11s screwdriver. DH scored with a photo I found for him of the aurora borealis over a town in Iceland and also a Dahlek that's battery-operated and will move across any surface without bumping into anything (shouting out EXTERMINATE! when it senses something's near) and won't fall off a desk! Lots of fun picking out pressies this year. I said something totally noncomittal when I opened it, something like, "OH MY FREAKING GOD YOU ARE FREAKING KIDDING ME!" I am not an easy person to surprise, nor to move beyond general apathy. I appreciate great presents, and love my new camera but things in themselves don't usually provoke such a huge reaction in me. I'm appreciative but almost never thrilled. Granted, part of that is chemically modulated to control otherwise intense depression. But DH did manage to shock me in this case. I can't feel that butterflies in the stomach effect but shock? In my own limited way, yes. Some receptor in my brain lit and that's about as big as it gets. I'd asked for a Kindle. Or, well, hinted about it because I was 99.9% positive he'd never buy one. I have a lowly Sony eReader I gave myself when I earned my Master's but it has a few drawbacks. So, when DH surprised me with an iPhone a couple years ago I merrily started downloading with its Kindle app (a bit too merrily, I sheepishly add…). Only, the screen is tiny and I do use it an awful lot since it's backlit and I can read it in bed during my frequent bouts of insomnia. It's also great for vacations and such. AND YES OF COURSE I LOVE PHYSICAL BOOKS! The most I dared dream of was a regular Kindle, something to which I could download my Kindle app books and read them more than two sentences at a time. But the Fire? Holy Mother of God. That's the motherlode. Otherwise, the day held what it always does, a breakfast of homemade waffles and a later – pre-Doctor Who – very big dinner featuring salad, ravioli, a nice beef roast and baked potatoes, topped off by a purely sinfully intense chocolate cake from Trader Joe's we buy every year. 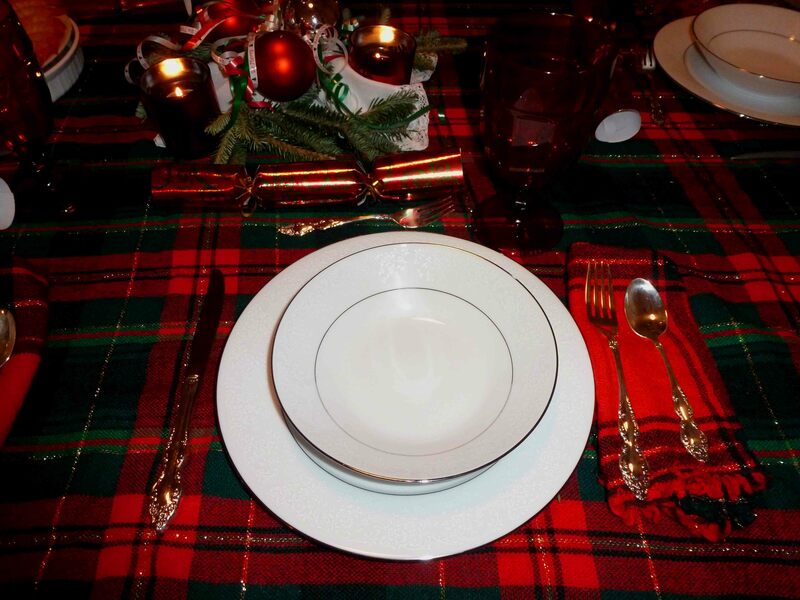 This is how my children will remember Christmas, with the table set using our lace tablecloth and red/green plaid table cloth and napkins. It's how I've always done it as long as they've been old enough to register there was something special about Christmas dinner. 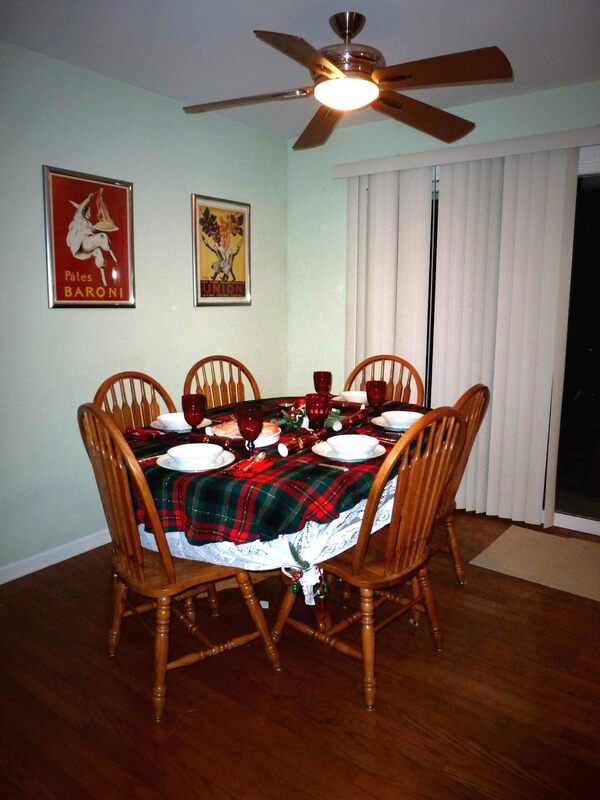 It's always the five of us together on Christmas Day. We may go to see relatives on Christmas Eve but we're never away from home on the big day itself. And, yes, most of the day is spent still wearing fuzzy, comfortable pajamas but for dinner DH and I are at least showered and dressed respectably. We do maintain some semblance of a standard. Not much but some. As we always say at home, it's not as if the Queen were coming (oddly, it's never the president…). Then we proceed to act as we would were we to entertain a foreign dignitary, our colonial ignorance and complete lack of social decorum entertaining us far more than I should probably admit. The fact DH and I were once within a very short distance of QE II, and directly in front of Prince Philip, is invariably brought up and then my statement if I ever meet the queen I'll grab and hug her. Fie on royal protocol! And that's how we do it in the Colonies. Though, as far as I know, I have no English in my bloodline (I'm Irish/Dutch with a dash of Native American and who knows what else), one English convention we do observe is the Christmas cracker. Endless fun it is, too. I started it about, oh, maybe five or six years ago when I saw them in a store and decided this would be a fun addition. And from addition it quickly turned into tradition. In addition to our paper crowns (a purple one for me, which I almost immediately ripped accidentally) I received a tiny flashlight, one of my sons a pair of scissors and the other an odd little calendar. Post-dinner was the Doctor Who Christmas episode followed by It's a Wonderful Life for DH, while I played with my Kindle and the kids were off somewhere doing what children do minus adult supervision. And that, friends, is how the holiday was spent Chez Bluestalking. Hope yours was jolly and all that. Now, onto a stretch of days off then thoughts of the coming New Year. Just give me a day or two before I'm expected to resolve anything. Frankly, stuffed with chocolate as I am it's not the best time for self-examination. 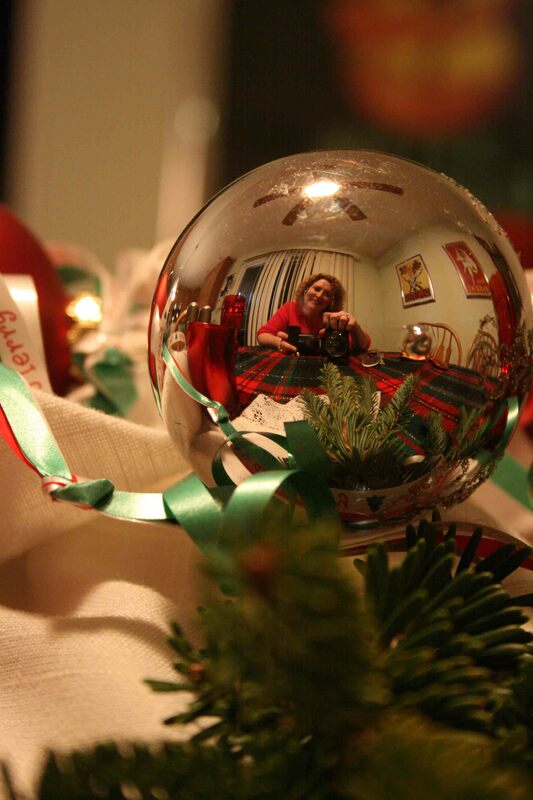 Save for this wee bit of me, hoping you and yours had a lovely Christmas Day. I sounds like you had a wonderful Christmas! I surprised my husband with a Nook Simple Touch and he’s having a ball downloading books from our local library. I still have far too many unread “real” books to justify getting myself an ereader, but I would like a new camera like yours. I need something small to tuck in a purse when my Olympus SLR is too awkward to haul around. 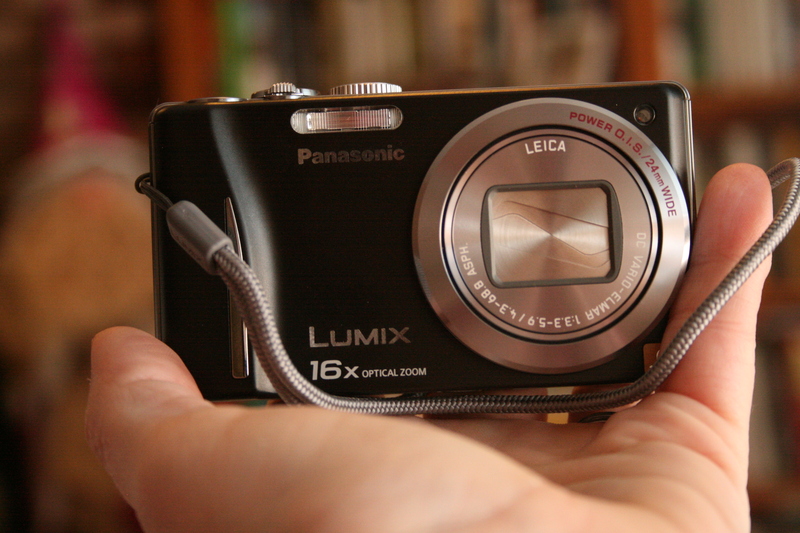 Let us know how you like your Lumix after a few months of shooting, if you don’t mind. Leslie, It’s way too easy clicking your way to some serious money in eBooks, you’re right. 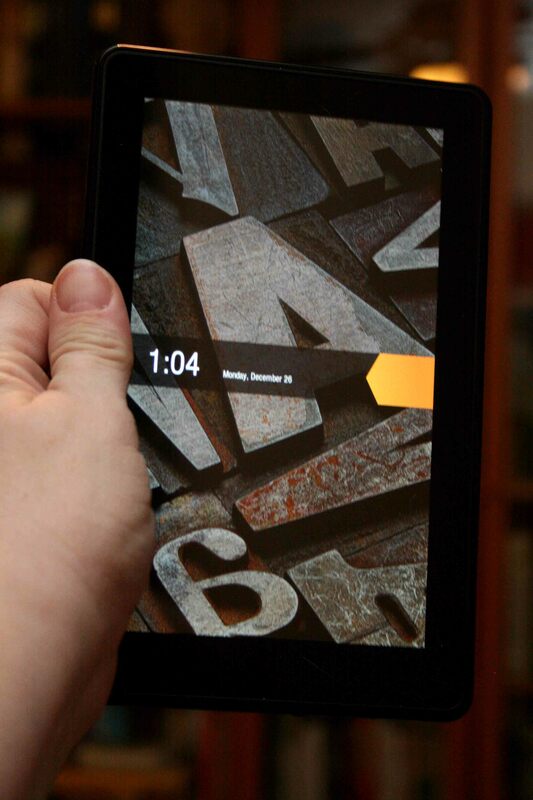 Kindle’s now set up for downloading library books, too. I haven’t tried it yet but we’ve been promoting it at my library. And I’ll let you know about the Lumix. My issue was the same as yours. My Canon is one of the smallest SLRs but still big to lug around. Previous Post Ho, Ho, Holiday Wishes. Next Post DH’s new toy – the amazing video!